General Description: The Hardee Beveled is a medium to large sized stemmed projectile point that occurs in two forms. One form has a distinct uniface bevel on the right side of each face. The second form has typical bifacial beveling. The shoulders are tapered to horizontal and are sharp. The blade edges can be straight, excurvate to incurvate and may show some fine serrations. The typical material used in manufacture is chert and coral. 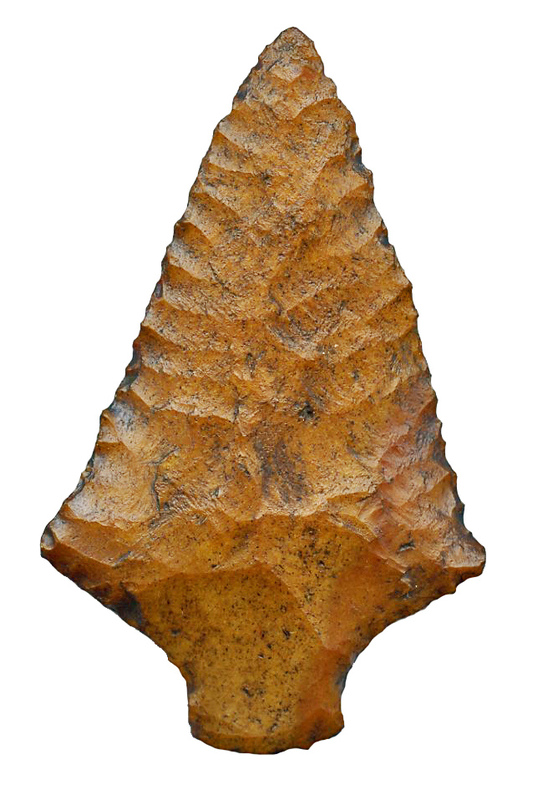 The Hardee Beveled resembles the other Florida Archaic Stemmed point types and as such I view it as a subtype. The Hardee Beveled points are found in Florida and Georgia especially in the Tampa Bay area. and extend into adjacent states. The point was named by Kevin Dowdy and John Sowell in 1998. The point was also generally described by Ripley Bullen in 1975 as a fairly thick point with trianguloid blade the edges of which are unifacially beveled.